Spring has sprung with some glorious weather and over 250 wondrous entries. A massive well done to all the exhibitors and volunteers involved. A lovely afternoon. Have a look out for the slightly strange flower arrangements in the 'April Fool' and 'Eggstravaganza' categories. We had fascinating talk from David Masding on the history of our much loved Bodnant Garden. After this we have a short AGM during which the committee will fed back on events from the year and a new committee was elected. As always the cake was marvellous. A very blustery day but us hardy gardeners were out enjoying ourselves. Many pots of dwarf iris and narcissi were planted to give us something to look forward to in Spring. Kevin Bailey had some unusual cacti and specialist advice. There were garden tips and the chance to make eco-friendly planters from newspaper. Lyn from Forever Living Products showed us the benefits of Aloe and a few Christmas presents were ordered. And, of course, the homemade cakes and company were excellent. Despite the very dry summer our gardeners produced a fine display of flowers, fruit and vegetables. 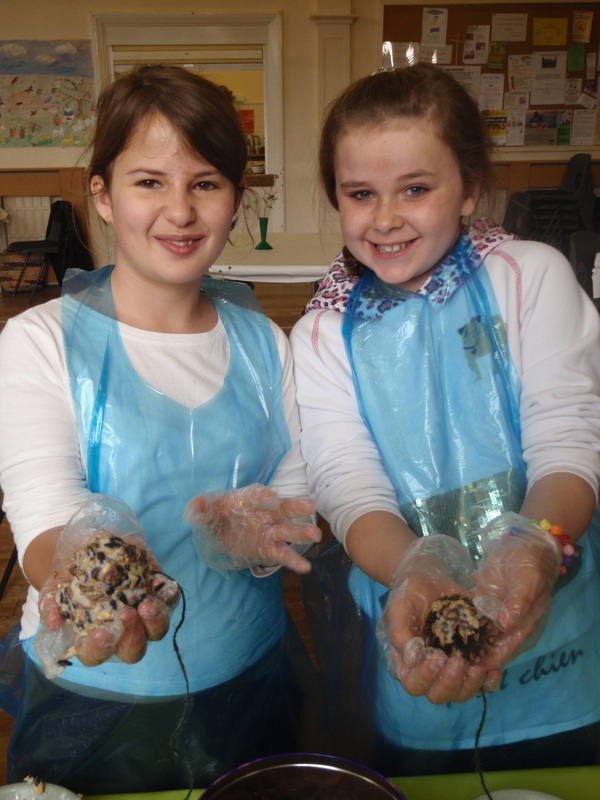 The cooks and bakers excelled and the photographs were lovely with some very cute sheep. Over 300 entries and the judges reported back that we certainly match the quality of the much larger shows held in North Wales. There was a lot of homemade cake sold and plenty of friendly chatter in the cafe area. Well done to everyone and a massive thank you to the volunteers that help the day run so smoothly. Absolutely wonderful, loads of plants changed hands, lots of happy chat and cake eating and we took over £1000 for the society funds. What a great morning. ​A massive thank you to all the growers, bakers and volunteers. Despite the dreadful weather and slow start look what members managed to enter. An impressive 276 entries and an incredibly high number and quality of craft exhibits this year. Well done everyone. The Mayor, Jeff Pearson, presents prizes at our Spring Show. Look out for the best in show tulips and the fabulous needlework that won best in show for the crafts. 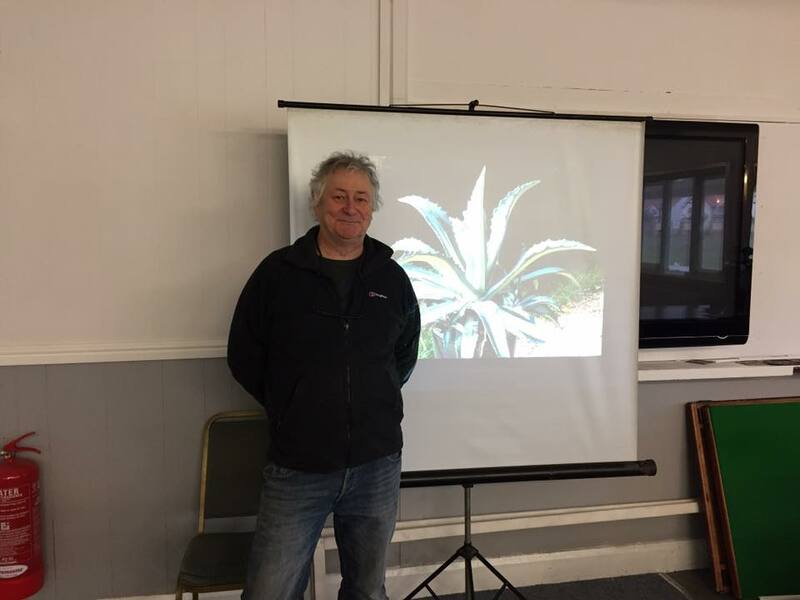 We had a grand talk about cacti and succulents from Kevin Bailey, elected a new committee, did all the official AGM stuff and ate gorgeous cake. A good morning was had by all in a freshly decorated cricket pavilion. Very nice. What a creative morning. We had displays from Sarah Gorst with her fabulous knitted hats and scarves, Joy and the RSPB gave bird and hedgehog advice, Andrew Jenkins painted throughout and Aubyn Designs demonstrated paper flower making. We could buy plants, seeds, homemade craftwork and plenty of amazing cake. We planted bulbs, make cards from leaf prints, propagated succulents, made wreaths and chatted with friends. Many thanks to everyone that helped out. We had over 400 entries, that is 100 more than last year, and plenty of new entrants who had very high standards. Our entrants ranged in age from 6 to 89. The plant stall and raffle had to be in the porch the hall was so full. The puddings made using Autumn fruits were incredible, the roses smelt amazing and as for the best in show carrots, very impressive. Thank you to Bay of Colwyn Deputy Mayor Stephen Williams for his enthusiastic presentation of prizes. The Home Produce Judge is Mrs Margaret Griffith-Williams of Llanfairfechan, one of our longest serving judges. Margaret trained as a Home Economics teacher specialising in food and nutrition. Her first teaching post was as Food and Textiles teacher at Eirias High School. In 1976, she moved to Ysgol Bryn Elian and was soon promoted to Head of Home Economics, then Head of Design and Technology and finally Assistant Headteacher. After 34 happy years at Bryn Elian she retired from teaching but continued to work as an Examinations Inspector for JCQ. Margaret was approached to be a judge when the show was held in the Four Oaks, Eirias Park. As a young, newly appointed teacher, she was asked by an elderly member of the committee if she was “the domestic science mistress from the local grammar school!” Fortunately for us, she said, “Yes..” and she has judged the home produce section every year apart from 2016, when she and her husband were celebrating their ruby wedding anniversary. Margaret has judged home produce at the Flint and Denbigh Show, the Eglwysbach Show, the Caernarfon Show and various Merched y Wawr cookery competitions. Margaret enjoys music and the theatre. She is a volunteer steward at Venue Cymru and is vice chair of the Venue Cymru Stewards’ Committee. It was massive, more people, more plants and the takings broke into 4 figures so the future of our shows is secure, hurrah. Boxes and boxes of plants found new homes, more people came through the door than ever before and tons of cake was eaten. That has to make it fit the brief of a successful event. Smiles everywhere and several new members. Thanks to everyone who grew and donated plants or made cakes. Get growing those flowers and veg ready for the Autumn Show. The gruesome bug at the end is a May bug or Cockchafer brought in by a member to show us. Joining in the fun and publicising the society. 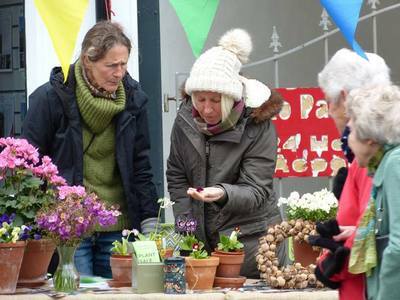 Another lovely display of spring flowers, scrumptious produce and creative crafts. Can you spot the floral arrangements "Here comes the sun" and "Twist and Turn" showing imagination and even a dandelion! Exquisite entries from new member Judith Neale graced the craft section and Gethin Coleman, who could have entered the children's categories but challenged the adults, gained three firsts for his eggs and baking. The best bit according to Gethin was "beating his Dad at the bread". Of particular note was Jaqui Jones, Jaqui has run the show for several years and has passed that responsibility on to Wendy Kitson. For the very first time she has entered the show herself with much success. 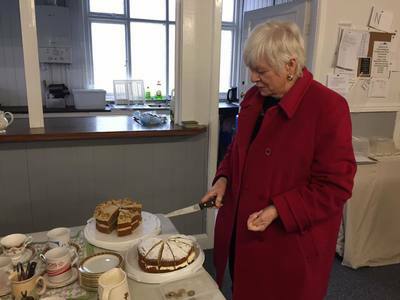 Spot her best in show Genoese Cake, look carefully and you will see much of it is missing as she shared it with the committee at lunchtime. It was fabulous. Most of the cakes we sell at the show are hers so you will be familiar with her skill already. 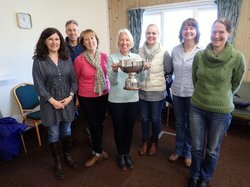 The Forder boys created wondrous stickmen, wellies and posies and were thrilled to finally win the cup from long term holder Ellen Fleet before her advancing years take her out of the children's section. Do we have any other young members to challenge them? A massive thank you to Barry Griffiths, the chairman of Conwy Beekeepers, for a fascinating talk on bees at our AGM. 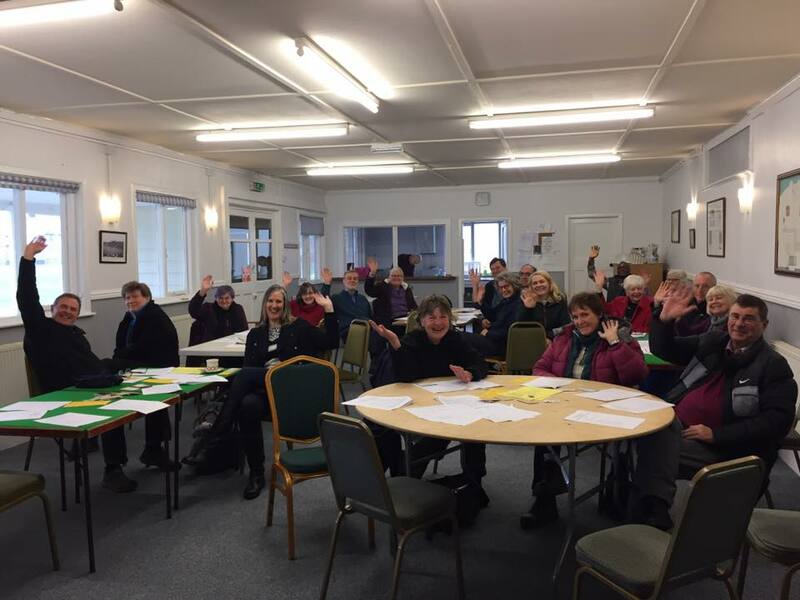 During the business part of the meeting the committee reported on a successful year and a new committee was elected. All specific posts were filled but there is space to co-opt more if anyone is interested. Don't forget to sow your free seeds and enter them into the Autumn show. A lovely morning of creativity, chat and cake. Bulbs were planted, lavender bags, spider plant pots and terrariums created, insects, amphibian and reptile remains closely examined (real ones), moths admired (real ones), pollinators chosen, bat boxes explored, plants bought, eco friendly cleaning demonstrated, fused glass admired, chutneys and jams tasted, homemade cake eaten and plenty of friendly chat shared. A busy morning enjoyed by many and raising money to run our shows. Many thanks to the contributors, volunteers, cake makers and those that shared their time with us. Mostyn Hall Kitchen Garden; Mandy Cartwright from ARC amphibian and reptile conservation; Gwynedd Bat Group; moth expert, Julian Thompson, from Pensychnant and Sarah Kearsley-Wooller, glass artist. We thought that members would like to know a little more about the people who use their expert knowledge to judge entries at the Spring and Autumn Shows. First up is the newest member of the judging team – Mr Edward Hughes (Ted) from Llanfairpwll. 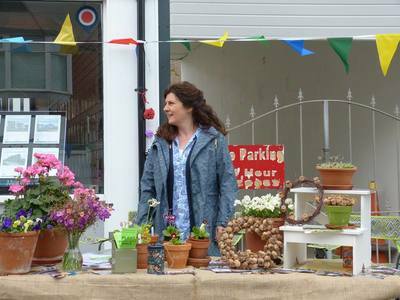 Ted judges at a number of horticultural shows in both Gwynedd and Anglesey. 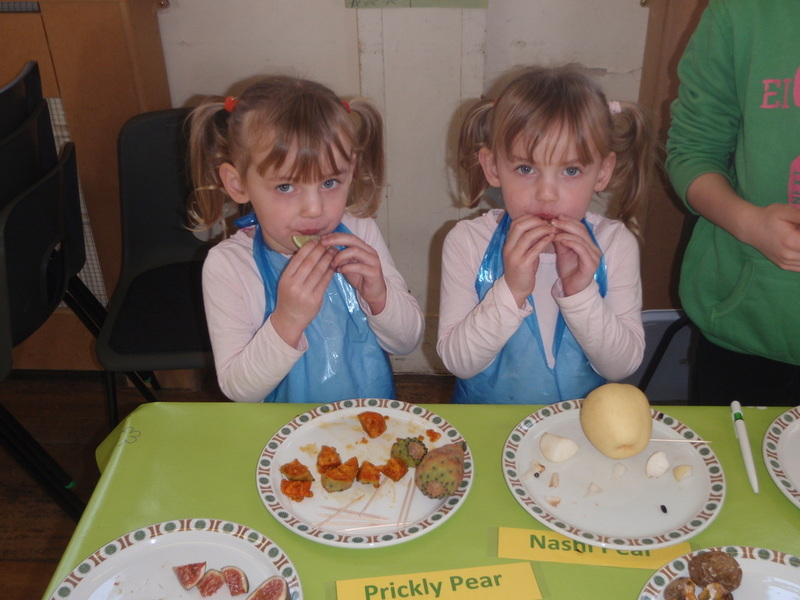 In September, he judged the vegetable section at our Autumn Flower and Produce Show for the first time. Ted comes highly recommended to us by Medwyn Williams. 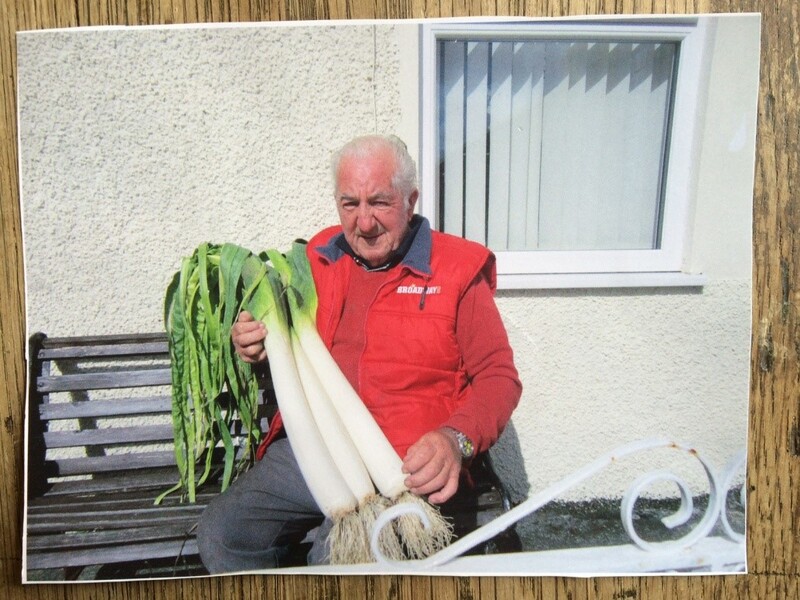 Ted’s favourite vegetables to grow and exhibit are leeks. Over 300 entries for our Autumn Show this year. The vegetable judge described the display as "tidy" and the organisation was said to be excellent. So praise indeed for the organisers as well as those entering. A literary theme for the photographs led to some inspirational pics. The titles "Sundance" and "Incredible Edible" challenged the florists, while dragons and unusual containers got the children being creative. Biscuits received the highest praise in the home produce. We shall need a bigger hall soon the displays get bigger and some of the plants in containers were definitely trees. Well done to everyone who took part, especially the kitchen volunteers who seem to have been missed from the photographs. Members of CBHS had a very enjoyable visit to Mostyn Hall Gardens. Rich in history and horticulture, there was plenty to see and Phil Handley enthusiastically explained the work going on there. Members were also treated to a delicious cream tea at the end of the visit with jam made from fruits from the walled garden. 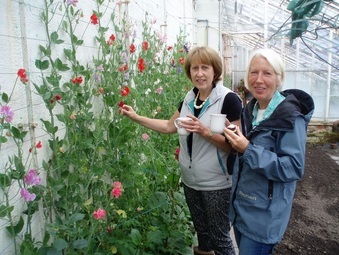 Plants grown by our prizewinning members sold to raise money to run our fabulous shows. Quality flowers and veg all tried and tested by local members so sure to give success. Lots of excellent cake, chat and inspiration. ​Lots of new members entering with 240 gorgeous entries. Competition was really tough in the home produce section and there were some exquisite crafts. The "Famous Painting" challenge gave us a best in show for a copy of Van Gogh's Starry Night. Just look at the detail. Some wacky aliens snuck in to the junior section causing much amusement. Roughly half of those who are Society Members entered the show, and everyone who entered won at least one prize. So this includes people who entered for the first time and the old hands. We think this is a record! A massive thanks to all that helped. The Ruth Cavill Cup was awarded to the society by Colwyn Bay Town Council for their contribution to Colwyn in Bloom in the Britain in Bloom competition. Ruth Cavill was Mayor of Colwyn Bay and was instrumental in galvanising the local community into improving the local horticultural landscape. As you can see we are very proud. Many thanks to David Cooper, who has been involved with Battys Nursery since 1959. An interesting and very informative talk on propagation with plenty of opportunities for audience participation. Several members left with a pot of treasured cuttings. The AGM went well with positive reports from committee members and election of the new committee. Thanks to all that contributed their time and cake. The chickens were the stars of the day. Several of our members enjoy keeping chickens and hopefully a few more will be tempted. Plenty of expert advice was available as well as the real thing. The crafty people had a lovely time making gorgeous paper flowers, Christmas decorations using dried plants, homes for insects and admiring some intricate handmade pottery. Plenty of plants and cake were sold and tea drunk with chatter. A massive thank you to all that helped, the event raised money to support our shows. A record number of entries and very high quality according to the judges, our Autumn Show impressed all. The children made some wonderful "animals made of vegetables". The "pot to plot" entries looked delicious. Vegetable and flower quality was superb, the floral "gothic revival" looked architectural and moody while the "carpets of colour" were exquisite. A great show. A massive thank you to the exhibitors and all the volunteers and cake bakers. What a cornucopia of bargains! The pictures say it all. Just like the last day at Chelsea hordes of happy people carrying boxes of precious finds. A massive thanks to all involved, especially the growers, bakers and volunteer kitchen and stall holders. A healthy sum of money raised to support the running of our shows. A few more, Thanks Albert. Now I've worked out how to download other peoples pics this could get exciting! The cold weather meant a shortage of tulips but there was no shortage of imagination with the entries. Some excellent crafts, baking and flowers were exhibited. The floral categories; Dazzling Bright and Puzzlement showed great creativity and the photography section was even more impressive than usual. Looks quiet as the photographer was kept busy on the plant stall until the hall was quiet. The plant stall was cleared out, thanks to all that bought. Well done everyone and if you haven't entered yet, why not? This continues to be a popular event with plenty to do with compost corner, Wendy's wormery, bulb planting, plants for sale, an artist painting, Sarpo potatoes, hedgehog housing and night time prowling, creative Christmas decoration making, a 'Storm in a Teacup' competition and of course cake, tea and chat. Over 250 entries, some new competitors, fabulous quality and a good time had by all. A splendid day with many members spending the afternoon strolling, or climbing, around four very different gardens close to Bryn Euryn, Rhos on Sea. A big thank you to our members for opening their gardens to us all. It was a special treat, they had clearly been working very hard. Below are a few pictures taken just before the crowds arrived. Our biggest ever plant sale. Loads of special plants all grown by our members. A wide variety of herbaceous perennials, all tried and tested locally, annuals and a vast array of vegetables. This sale raised over £900. This will be used to support our shows and allow some additional classes to be added. As a thank you to members we will stop charging members entry to this event and the Autumn Garden Event in the future. Entry is already free to the shows for members. So yet another reason to join. The left over plants were sold to raise money for St Cystennin's church at their event the following week. We nearly had tears from one of the judges! How was he meant to judge those daffodils? The quality of the exhibits was so high it even provoked one regular flower show visitor to pronounce that we were as good as the big shows now. An incredible display of spring beauties with a fabulous "best in show" pot of deep red tulips to top them off. All displayed to their full potential on the new black cloths paid for from the profits from our plant sales. The crafts also raised the bar with exquisite needlework, painting and garden articles including a rather superior cold frame. A very popular morning with plenty of interest for everyone, bulbs to plant, flowers and goodies to buy, owls to stroke, artists and jewellery makers to watch, chocolate to win, crafts to create, red squirrel masks to make, hint and tips to read and add to, floral teacups to admire, cakes to eat, wildlife to discover and protect, insects to find, tea to drink and friends to meet. Many thanks to all involved and to Colwyn Bay Town Council for financial support. Our guests included Andrew Jenkins, watercolour artist; Sonia Davies, wildlife gardener; Joy and the RSPB, North Wales Bird Trust; Janette Gilbourne, jewellery maker and the Anglesey Red Squirrel Trust. A grand 265 entries were displayed and the competition was fierce and colourful. 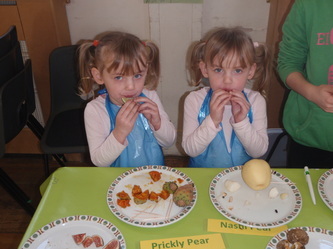 A few new names were amongst the top prizes and the vegetables featured a very successful new grower. A good day with plenty of graft in evidence. An unbelievable number of plants changed hands. The home grown section raised over £500 for the society and will support our next show. There were some very special named varieties to be had. People enjoyed planting their own seeds to take home. 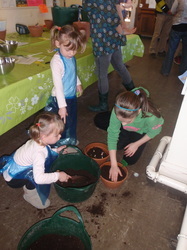 Sunflowers and candytuft were popular with the children and salad leaves should be sprouting on a few windowsills soon. Thanks to the Colwyn Bay Town Council and Tal Goed Nursery for their support, to the growers who brought some fabulous plants, the volunteers in the kitchen and raffle etc. and everyone that spent money. With even more entries than last year this was an impressive show despite a very cold start to the year. Some people even managed to exhibit tulips this early. This show was dedicated to Barbara Thomas. Thanks to Colwyn Bay Town Council PB for helping fund this wonderful busy day. 26 groups of children planted bulbs, make sure you enter them into the Spring Show.